no, you are not a fraud. I also don't write under my real name. Since - as soon as you start writing with real name and surname, you loose freedom to write everything that lies deep in your heart. And we did meet in person. It was great (but too short). This is a confirmation that we are both very real. You are definitely not a fraud! This is something I struggle with as well. By writing under a pseudonym I feel more at ease sharing my heart. Very few people in my real life know about our infertility and even fewer know that we'll never have children. Someday I hope to be a little more open, but I don't think I'm strong enough for that right now. I work in IT. Many years as a freelancer. I expect future employers and or colleagues to google me. And I want to give them a fair chance to respect my privacy!! ;-) There are too many people (search engines? criminal networks?) on the web that I cannot trust. you are far far far from a fraud. 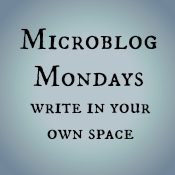 Many of us blog under different names, but I have always felt that it is simply self-care. We are a community that accepts people, there are many others that don't or won't. Be kind to yourself dear one. Not a fraud. The polar opposite. I struggle with this too. Even though I'm semi-anonymous, I worry constantly about the backlash from my words and thoughts. It's not easy to put them out there only to have them torn down. You are a role model. Even if you write under a pseudonym. Because you speak the truth boldly and beautifully. I think speaking the truth as Mali is not even remotely fraudulent. It is truthful, and beautiful, and free. I think it would only be fraudulent if you were pretending your name IS Mali. But I think privacy is important, too, and there are so many reasons to have that public voice and private voice. I can think of so many people who write or work under a different name. Aliases, pen names, pseudonyms.... you’re in good company with quite a number of other literary authors. We all know how accessible and convenient the internet can be, especially for those of us who are able to find these blogs of similar experiences, but it can also be too convenient and too accessible (and quite nasty) if you are trying to maintain a shred of privacy and decency with writing and commenting. I think this is part of your self-care routine. It’s the level of comfort you currently have versus putting it all out there for everyone (including friends and relatives who may stumble upon your blog uninvited) to trample over. Your writing touches all of us who read it, regardless of your name. I've done a lot of exploration of secrecy vs privacy, and my working theory is that the difference is shame (an ingredient in the former). There is nothing wrong with privacy; in fact, I see it here as a sign of a strong sense of self and healthy boundaries. Great quote. I love this. 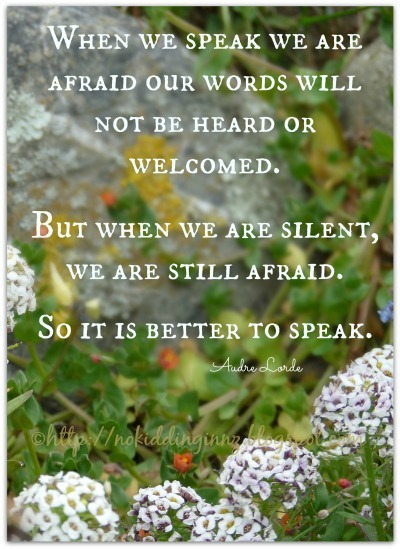 I have been finding my voice more lately in all aspects of my life and I will remember this when I get scared to say so.